The National Hydrography Dataset (NHD), Watershed Boundary Dataset (WBD), and NHDPlus High Resolution (NHDPlus HR) are updated and maintained through a strong community of Stewards and users. The Markup Reviewer, used by the USGS and the NHD state stewards to review suggested edits, is available for download at the USGS Hydrographic Data Community (HDC). The Water Resources Community of Use assists the National Geospatial Program in developing better, user-friendly data and tools for USGS hydrologists and Federal, State, and local water resource managers across the Nation. Just as building the NHD and WBD required a large partnerships across the nation, maintaining the NHD and WBD also requires an extensive partnership, and can best be accomplished by those closest to the hydrography. Users within the states and Federal lands understand the hydrography around them and are motivated to ensure the accuracy of the NHD to meet their business needs. They are uniquely suited to become the stewards of the data. The USGS facilitates the overall Stewardship process, providing national management, coordination, tools, standards, documentation, training, quality assurance, data archival, and data distribution, and Stewards provide local hydrographic knowledge through data editing and updates. Edits and updates to the NHD are made by Stewards and processed and made available in the national dataset distribution by the USGS. 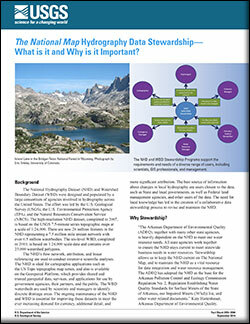 The National Map hydrography data stewardship: what is it and why is it important?